Shandong Taikai Prefabricated Substation Co., Ltd.
Shandong Taikai Prefabricated Substation Co., Ltd. (herein after called the company) was founded in March, 2005. It’s the wholly-owned subsidiary of Taikai Group Co., Ltd. (herein after called Taikai Group) and has been rewarded as National High-tech Enterprise. The company was registered with 300 million Yuan RMB, with total assets of 621 million Yuan RMB and the operation revenue in 2017 is 940 million Yuan RMB. Pursuit excellence and repay the society. "Keep the leading position in domestic market and strive for first class in the world." is the unremitting pursuit of all employees of the company. The company strives for the survival by the quality, promotes the development by the science and technology, creates the brand by the good faith, wins the market by the service, provides the customer with the excellent product with reliable quality and first-class service. Shandong Taikai Prefabricated Substation Co., Ltd. (herein after called the company) was founded in March, 2005. It’s the wholly-owned subsidiary of Taikai Group Co., Ltd (herein after called Taikai Group) and has been rewarded as National High-tech Enterprise.The company was registered with 300 million Yuan RMB, with total assets of 621 million Yuan RMB and the operation revenue in 2017 is 940 million Yuan RMB. The company now has more than 1,000 employees in which 119 are R&D personnel. Keep the leading position in domestic market and strive for the first class in the world. "Keep the leading position in domestic market and strive for first class in the world." is the unremitting pursuit of all employees of the company. The staff of the company are full of confidence, carrying forward the spirit of the enterprise, adhering to the tenet of the enterprise to strive for survival with quality, promote development with science and technology, create a brand with integrity, win the market with service, provide more and better quality products for customers. Shandong Taikai Prefabricated Substation Co., Ltd. is a wholly owned subsidiary of Taikai Group, China's well-known Trademark Enterprise, Key High-tech Enterprise in National Torch Plan, Backbone Enterprise of Tai’an Power Transmission and Transformation Equipment Industrial Base in National Torch Plan, Contract First, Credit First Enterprise, High-tech Enterprises in Shandong Province, Shandong Famous Brand Products Enterprises. The Company sticks to the tenet of "pursuit excellence, repay the society", and puts social responsibility in the important position. The company implements science and technology innovation in the industries such as low carbon environmental protection of new energy generation, energy-saving power grid construction, railway electrification ect. Through continuous cultivating, training and introduction of high level talents, the company has built its own R&D team and developed into provincial technology R&D center. Under the enterprise spirit “Integrity, honesty, pragmatism and innovation”, the company has always been trying to provide more excellent products to customers. The annual physical examination of special jobs has been conducting since Jul. 27th, 2018. 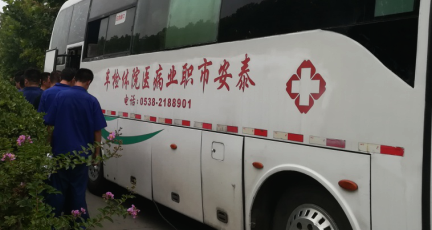 After examination by Tai’an Occupational Disease Hospital which is the Branch of Tai’an Center Hospital, all staff passed examination and no occupational disease happened which lays adequate guarantee on the normal operation of our company. In accordance with the lowest cold start energizing temperature (LCSET), transformer oil is divided into: 0 ℃, -10℃，-20℃，-30℃ and -40℃ which is used to apply in different environment conditions for electrical equipment. 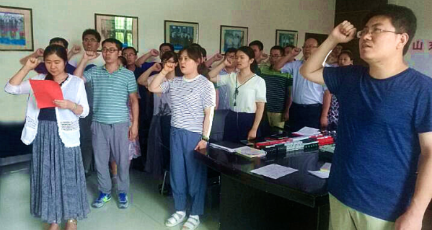 On June 28, 2018 in the afternoon, the communist party of China (Shandong Taikai Prefabricated Substation Co., Ltd.) party branch reviewed "The Admission Oath", "Stay true to the mission"
Any questions, please kindly leave us a message.